I notice details about other people. The way they walk, how they carry themselves, what they are wearing, the combination of their outfit, what jewelry they have on. Not everyone do I notice, only subtle details about certain types of people come into consciousness … and very rarely do I notice people’s faces. (I have admired a sweet jacket on the stranger in front of me, walked past them not recognizing them, then felt quite sheepish when I hear my name called out and it is a close friend.) 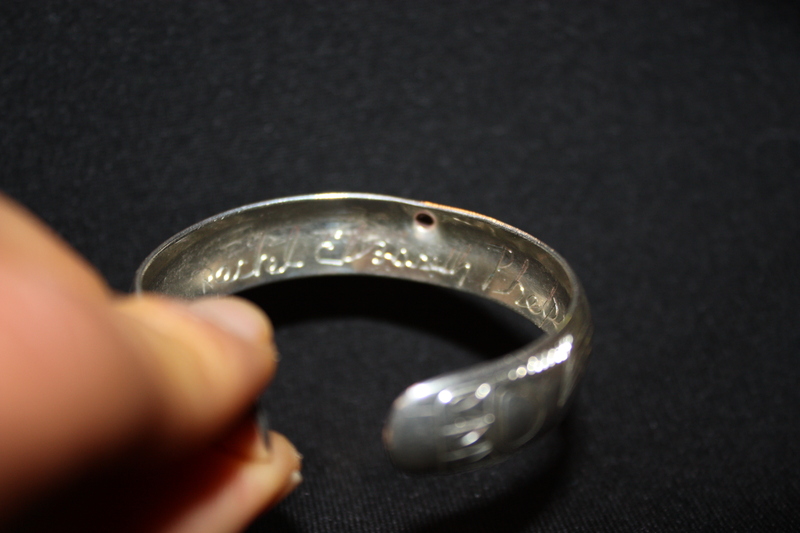 Something that I have noticed a lot within the past year or so, is the simple addition of a silver cuff bracelet. I found that this subtle addition to a person suddenly takes the ordinary person, in the ordinary throes of their day, and adds a bit of class to their unique presence. I wanted that feature, so how do I incorporate that look into my own unique style? I spent months studying this detail in others and trying to figure out the style that fit me. Did I want an antique bracelet? Did not find any on ebay or etsy vintage that I liked. I for sure knew that I wanted something hand made, but did not like anything on etsy either. 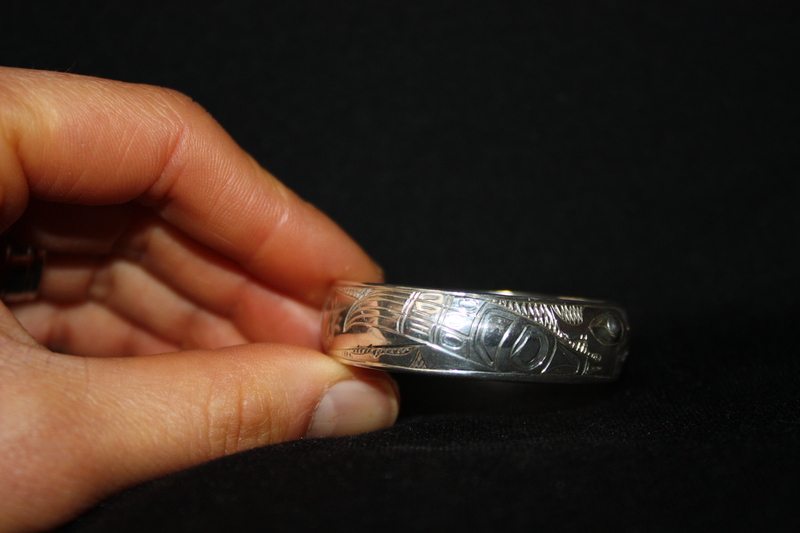 Did I want a bracelet with Alaska Native art on it? I am not native first of all, so how do I decide on a design that is unique to me and not mainstream designs. I have an artist friend from my college days and I thought about asking her to make something for me but that would be difficult as I did not know exactly what I wanted. 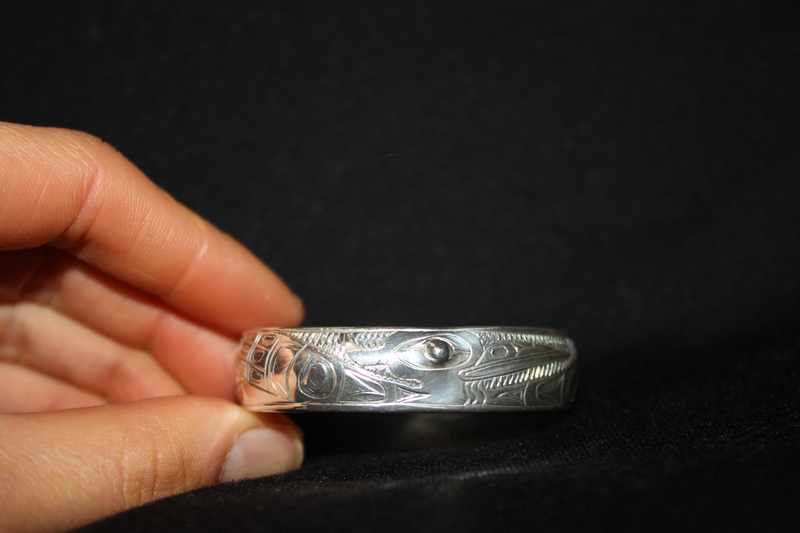 When I discovered that one of the most experienced and talented Tlinget silver artists was the husband of a co-worker at the hospital, I knew what direction to head. I started researching his work and stumbled upon a design that I had not seen before among the traditional Native artwork and it was a design that has always been a detail in nature that has captured my attention. The great blue heron, a fascinating bird that is unobtrusive in his activities, quiet but always observant, has the initial appearance of an awkward and gangly water foul but is incredibly gracefully when walking through the water and flying through the air. A bird that exudes a quiet, confidence in its presence. I set up an time to go meet Gene Chilton in his home, we looked through designs and I brought up the one I liked best. He agreed to make the design smaller to fit on a 1/2 inch wide band instead of the normal 3/4 inch band and also agreed with me that I needed the smaller cuff and not the normal adult size. I began to ask him questions about how he carves; he does all the carving free-hand, he does not initially trace the design and carve over top of it. He even said “I don’t even need a picture anymore because I know the drawings so well.” Amazing. His signature detail is the eye of the bird or animal that he carves and it really makes the piece stand out. To say the least, I am so please with the final product. And completely enamored with it. Remember all the carving is done free-hand! Absolutely unique to you as well as beautiful…a perfect fit for your personality! Hope to see it ON you some time. What a beautiful way to remember your grandparents. I am sure they will be touched by the thought that has gone into this piece of jewellery.